Children get bored during the holidays and every mom has to listen to, “Mom!! What do I do? I’m getting bored, sun’s shining as bright as it can and there is no fun indoors”. SIRS has a comprehensive summer activity bucket list for its children and today lets talk about kids’ favorite activity, ‘swimming’. So children just jump into the swimming pools and rejoice, let yourself loose and think no more, swimming is more than an exercise it is a mode of enjoyment and a way of life. Swimming provides loads of health benefits which keeps heart and lungs healthy, improves immunity, develops strength and flexibility, increases stamina and lots more and all these leads to a healthy and positive living. Safety First: It is of prime importance that a child learns to swim when he or she is very young as there is water all around us and he should be comfortable and safe in it. Physical balance: Swimming is the best form of exercise. To be fit and healthy one must adhere to swimming. It helps in keeping your body in shape, keeps it toned and facilitates in growth. Emotional Balance: Children go through a lot of stress these days because of the competitive atmosphere around them therefore it’s important for parents to help them release the stress by easing them out through regular conversations with them and involving them in some physical activity and what’s better than Swimming as it doesn’t require any equipments. Swimming helps children to balance their emotions. Time management: Swimming teaches one of life’s most important lessons; time management. Time management means the ability to use time effectively and productively. It is a skill that swimmers will hold for the rest of their lives. Children get to learn to divide and manage ones time and prioritize what they need to do first as per their needs. Team Spirit as well as individual: Children need to be self motivated and also they need to set their goals. As swimmers they have their personal set timings for their competitive events. They keep beating their personal best score as well as their teams. So they learn to motivate their teams and themselves. Once a swimmer always a swimmer: Once you learn how to swim you will never forget it, infact you grow old with it. As one gets old the bones become weak and falling and getting hurt is a big problem, to counter this researchers have found that swimming is the only physical activity that reduces the risk of falling and what’s better than having a sport for life that helps you in every way!!! Sleep like a baby: Swimming is exhaustive and you get a good sound sleep at night after it. Say a goodbye to insomnia. Stay tuned to this page for the next update with another exciting activity!!!! SIRS has the state of the art swimming pools for its children. 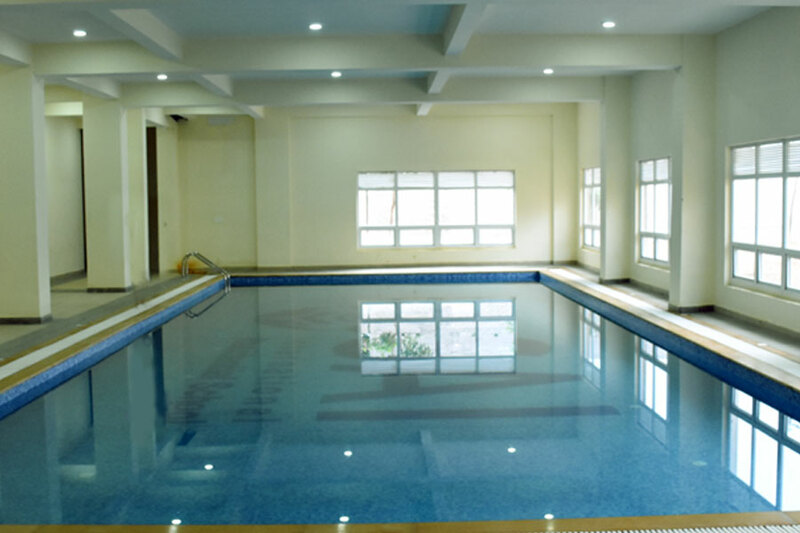 There are two pools for both girls and boys where they learn, play and practice for competitions. SIRS has expert trainers who train and motivate the children and prepares them for the future.